I like to build off of my children’s interests, continuing to offer opportunities to learn and play when I see them enjoying a particular topic. 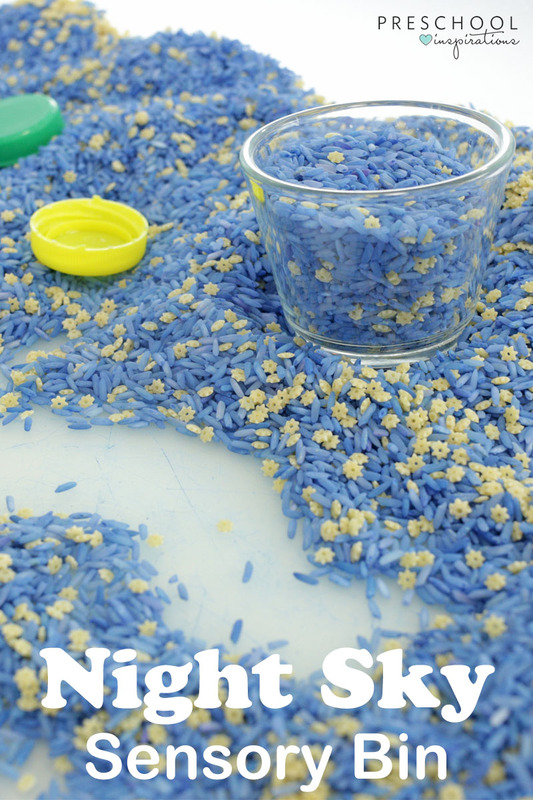 This week, those interests led to the creation of a night sky sensory bin to explore. On warm summer nights, my kids and I like to stay up late and gaze at the night sky. It’s something we enjoy doing together as a family and it provides a great learning opportunity! We talk about constellations, planets, and of course the moon (my three-year-old is obsessed with the moon). 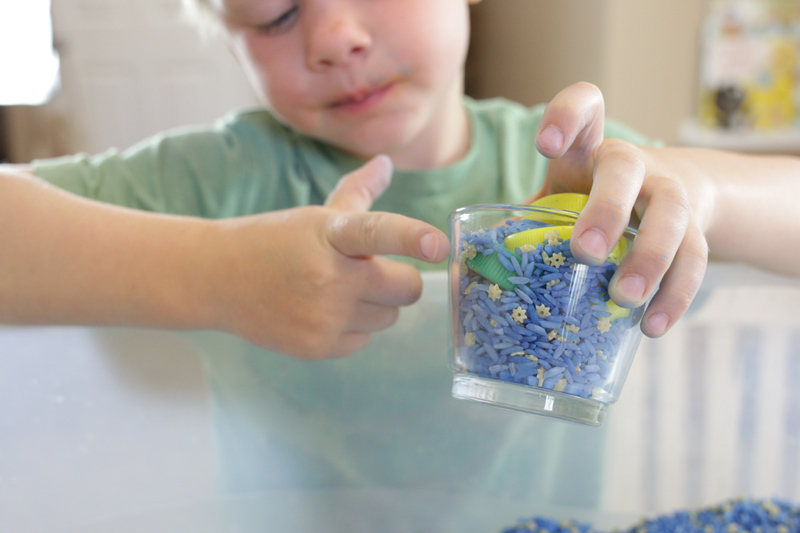 This bin is so easy to make and it will offer months of sensory fun! It only requires a few common household items to put together, too. Milk caps, spoons, small bowls, etc. 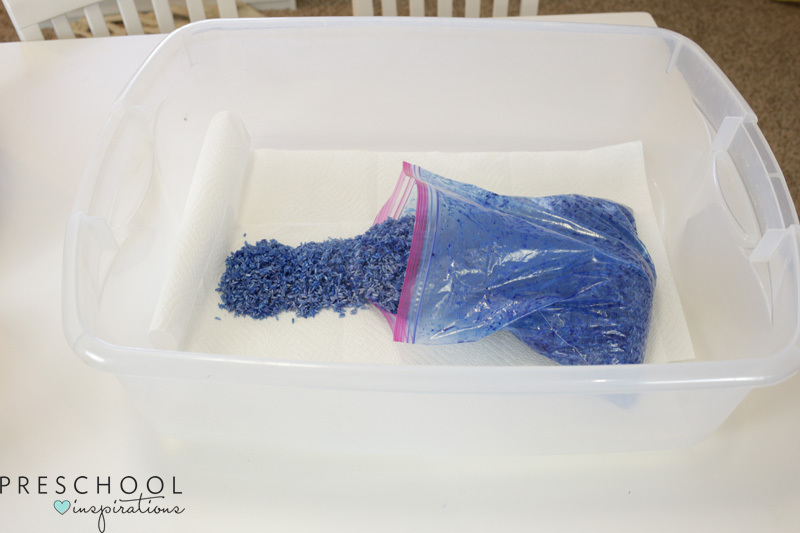 Rice makes a fantastic sensory bin filler as it is inexpensive and can be dyed just about any color you have on hand (we used blue food coloring and a hint of purple). 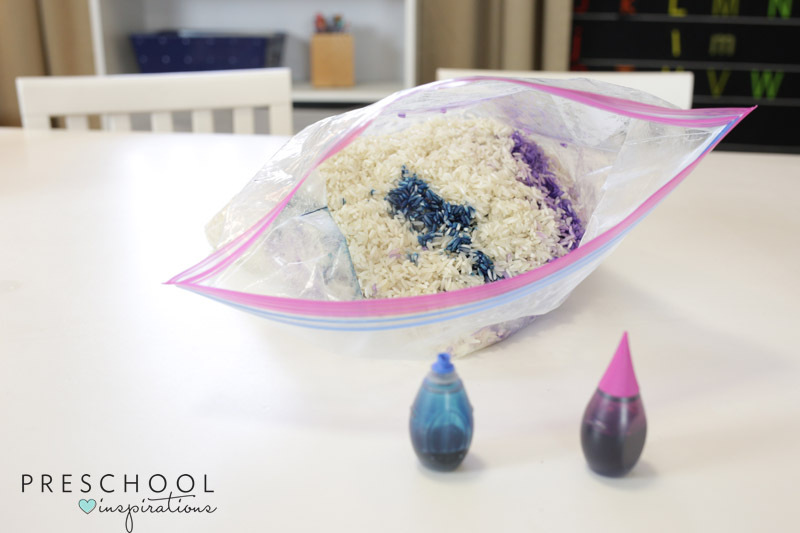 If you haven’t dyed rice before, it’s a simple process. I Measured 7 cups of white rice into a Ziploc bag and added 1/3 cup with generous amounts of food coloring. Next, I sealed the bag and shook it up to evenly distribute the color. Once the color was well-mixed, I laid paper towels into a large Rubbermaid storage container. I dumped the rice onto the towels and set it outside to dry (note- the smell of alcohol will be very strong. Keep this in a well-ventilated area until it dries completely). Once dry, I removed the paper towels and mixed in a cup of star-shaped pasta (no need to dye it since it’s already yellow). 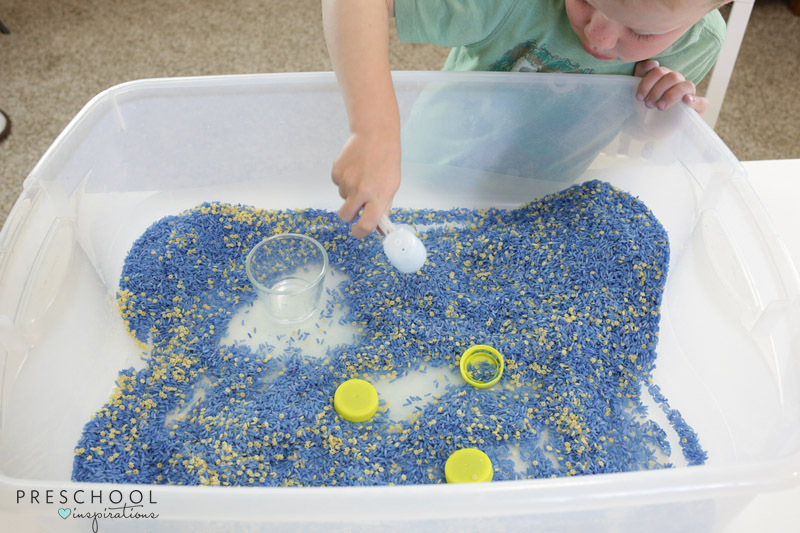 We also added milk lids, spoons, and a small clear cup for sensory play and exploration. My three-year-old dug right in! The milk lids became planets as he scooped, arranged, poured and dumped to create his own little galaxy! 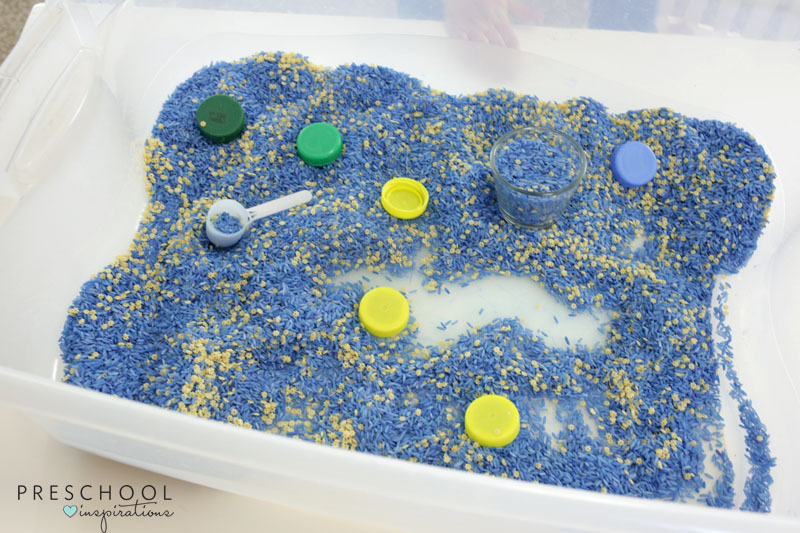 Themed sensory bins like this are a great way to give kids a chance to learn in a hands-on environment. They invite kids to learn about new topics while stimulating their senses. I’ve heard my kids create stories while playing with sensory bins, sing songs, and work together with peers in collaborative sensory bin play! Combining this bin with a story about space and this Galaxy Calm Down Bottle would be a way to continue learning about all the wonders the night sky holds! We also created a Starry Night Bin to learn more about the famous artwork from Vincent Van Gogh. Enjoy all the learning taking place with this fun and simple activity!